It is estimated that 80% of adult Americans suffer from adrenal fatigue at some point in their life . It is time to take control of this illness! Maintaining healthy adrenal function is critical to preventing disease and promoting longevity. Adrenal gland imbalances are one of the major factors that cause thyroid disease. Once the adrenal glands are healthy, the thyroid naturally balances itself. Anyone can experience adrenal fatigue at a point in his or her life. Certain diet and lifestyle factors can make a person more susceptible to adrenal fatigue and chronic fatigue: nutrient deficiencies, inadequate rest, life crisis or too many pressures can all drain the adrenals of even the healthiest person. As someone who suffered through these factors, I can relate how adrenal fatigue affected my life and share with you how I successfully cured myself of this deficiency. Join me, Andrea Beaman, in this two-part DVD (seminar plus cooking class) and learn how to reclaim your energy and properly nourish your body. I love this DVD and would recommend to everyone. She gives so much information & answers questions. The cooking part is awesome. My husband and I have watched the DVD twice. Also, her humor makes it all worth while. 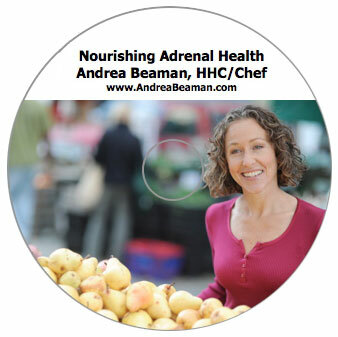 Andrea's Nourishing Adrenal Health DVD is full of great information presented with passion! Andrea shows us how to heal ourselves in today's fast paced, highly processed world. The information here is both enlightening and useful. If you often feel low energy or just want to learn more about taking control of your health I encourage you to watch this presentation. The message is simple and straight forward! Andrea Beaman does it once again! Really beautifully done dvd! I really liked the audience participation and the fact that it was based in the kitchen. Andrea could talk about what she was doing and why it is beneficial for overall health and the adrenals. As always, I learned a ton, enjoyed watching her cooking, laughed (Andrea Beaman is such a hoot to watch!) and got inspired. Thank you so much. I've implemented a lot of this already.